Desserts are sweet foods served at the end of a meal. Dessert is essentially a French concept. It was the French who, in the 1600s, divided sweet parts of the meal from the sour and savoury parts. Until then, European cooking had followed the Roman tradition of making no such distinction. (See the entry on “French Food” for a full discussion.”) Chinese cooking and some Middle Eastern cooking still do not. Thus, we have the famous “sweet and sour” dishes in Chinese cuisine. Chinese meals don’t “natively” have the concept of a sweet course at the end of meals, thus, the invention of fortune cookies in North American Chinese restaurants. The term “Dessert” is used in America, Australia, Canada, Ireland and France. In England, some consider the word “Dessert” to be vulgar, and call it “afters”, the “sweet” or “pudding” instead. The upper-class preference is for “pudding.” But they will still call a dessert spoon a dessert spoon. In the food business in England, though, dessert has definitely become the term used by food marketers, etc. 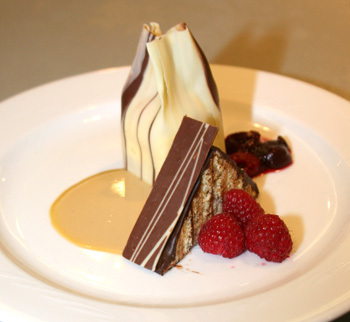 Desserts can be served room-temperature, warm, hot, chilled or frozen. They are usually a sweet food, but the Dessert course can include a savoury item such as cheese, or nuts. In America, traditional desserts are jellies, puddings, pies, cakes and ice cream. If cheese is served, it would be as a wedge of cheddar to the side of a piece of apple pie. Desserts are usually eaten either out of hand, with a fork, or with a spoon. There are very few drinkable desserts. Dessert in North America and Britain is traditionally accompanied by a cup of coffee or tea. In Italy or France, coffee is rarely served after a meal with Dessert. To people in the English-speaking world, older desserts such as pies are seen as comfort foods, especially if homemade. Japanese desserts are often based on rice (“mochi”) and pastes (“anko”) made from beans. 80% of all Adzuki Beans grown in Japan are used for sweets. Most custards made are dessert ones. There are also savoury custards, though, such as quiche. Most people think complicated when they think about making a dessert. A simple but good dessert can be fresh fruit, with good pouring or spooning cream on it. A dessert spoon is half-way in size between a teaspoon and a tablespoon. Supermarket bought Desserts have edged up in price, but rather than tasting better because of the higher price tags, have come to taste more “chemically” and artificial , and so many people just give them a miss. Why pay more and more for something that is tasting worse and worse? Proper bakery-bought ones are hard to procure, with supermarket bakeries having driven most of the real bakeries out of business. And with stay at home mum’s now a rarity, there’s no one at home who has time to make desserts. Desserts are a boost for restaurant profits, and can be one of the highest profit margin items on the menu. Desserts that contain fruits are popular on restaurant menus at the start of the 2000s, though chocolate remained the number 1 ingredient that people looked for. In some British restaurants, the dessert trolley cart is still wheeled around. This helps increase sales — people’s eyes may do the sale for you that words on a menu failed to do. Some American restaurants are trying out the concept of a dessert trolley once again. Dessert bars started to become popular around the start of the 2000s in big American cities such as Boston, Chicago and New York. They are open late at night for after theatre or after cinema crowds, and even offer wine suggestions to go with your dessert. There are many low-fat, low-sugar, low-calorie desserts commercially available now. Fat has an important role in desserts, creating texture and moisture, and carrying flavour. The fats are usually hard fats, such as lard, butter or shortening. It’s a fair bit of trial and error to replace them in recipes. Some say even if you do, the desserts don’t taste good enough to be worth the bother: they’d just rather have an occasional small amount of a really good dessert. Still, the sugar-free ones are good for diabetics. “XXIV. AUTRE DISNER DE POISSON. Premier mets. Pois coulés, harenc, anguilles salées, civé d’oïttres noir, un brouet d’amandes, tieule, un bouly de brochets et d’anguilles, une cretonnée, un brouet vert d’anguilles pastés d’argent. Second mets. Poisson de mer, poisson doulx, pastés de bresmes et de saumon, anguilles renversées, une arboulastre brune, tanches à un bouly lardé, un blanc mengier, crespes, lettues, losenges, orillettes et pastés norrois, lux et saumon farcis. Desserts really came into their own, in terms of being accessible to everyone, with the appearance of affordable refined white sugar. In the 1800s and 1900s, the dessert was often considered the highlight of the meal. Sweet items to snack on during the day were not as common then as they were to become later. At potlucks, many women would make sure they got assigned the desserts, because the desserts were sure to be the things that people noticed and talked about. Dessert at the end of dinner came to also be seen as a sign of prosperity, and a properly managed household. Dessert remains solidly traditional at some holiday meals, such as Thanksgiving and Christmas. The word “Dessert” comes from the French verb “desservir”, meaning “to clear the table.” It’s what was served after the table was cleared of the items that were on it for the savoury portion of the meal. Many hosts and hostesses still insist that the salt and pepper, and any tracklements, should be removed from the table before dessert appears. “Après Moi, Le Dessert” is a cleverly titled book by Jim Chevallier presenting recipes for an eighteenth century French model meal. Re consumers seeking supermarket bakery desserts with fewer artificial flavors. Pointed noted in: Fox, Jennifer Barrett. “Permissive Balance.” In Modern Baking, December 2006, (Vol. 28, No. 11), 51-52, 54, 56, 58. “Sweetgoods Still Loosing Share,” in Modern Baking, May 2010 (Vol. 24, No. 5), p. 12. Balzer, Chris. “Convenience Drives Cake Sales.” InStore Baker, March 2010, (Vol. 5, No. 2), p. 18-20. Mintel International Group Ltd. Desserts – UK – May 2009. Published 2009/05. Hough, Andrew. Pudding trolleys ‘should return to restaurants’. London: Daily Telegraph. 10 September 2010.